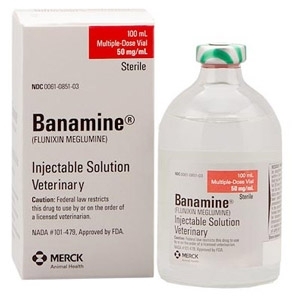 Banamine brand of flunixin meglumine is the pioneer injectable non-steroidal anti-inflammatory drug approved for cattle and horses in the United States. Banamine reduces the fever and lung inflammation that typically accompany bovine respiratory disease (BRD). Banamine® Injectable Solution is recommended for the alleviation of inflammation and pain associated with musculoskeletal disorders in the horse. It is also recommended for the alleviation of visceral pain associated with colic in the horse.